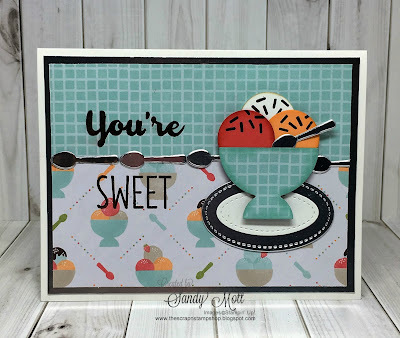 A quick post today of two more cards I made using the stamp set/framelit dies bundle, Cool Treats. This set is fast becoming my favorite. 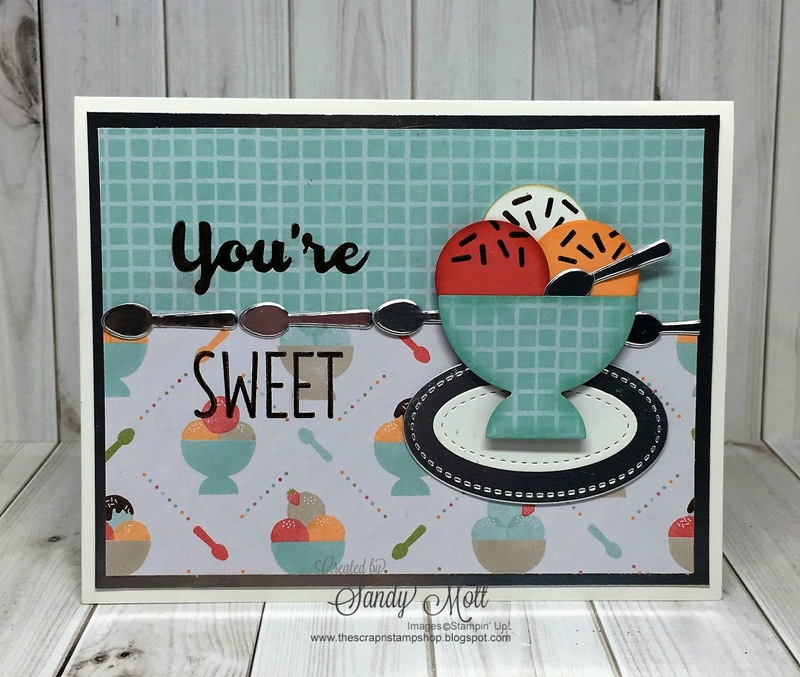 The Frozen Treats Framelits Dies make this card so easy. 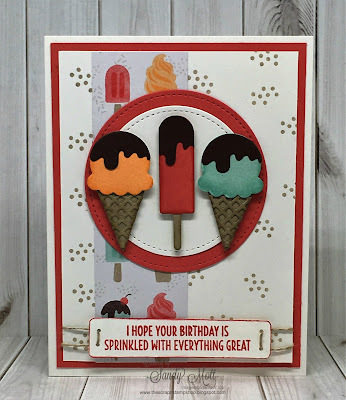 I stamped the little sprinkles for the background with Crumb Cake ink. I punched the sentiment with a tiny hold punch and threaded the linen thread through. Don't know why I did it like that except it was just something a little different. But bottom line, it sure looks good enough to eat, right? I also sponged the edges on the ice cream and cones with the same color ink as the paper to give it some depth. I used the spoons, cut in Silver Foil, as a border between the different printed papers. I made a silver charger to go under the white plate that the bowl of ice cream sits on. Again, just for something different. I hope you enjoyed today's quick post. I would love to hear from you! Sale-A-Bration is underway! It's a great time to join as a Stampin' Up Demonstrator, whether you want a business or as a hobby and get great discounts on your purchases. Joining during Sale-A-Bration gives you two EXTRA stamp sets of your choice. See "Join My Team" above for all the exclusive perks and contact me today! Cool cards Sandy:-). Yummy!! My Cool Treats framelits should be here tomorrow - can't wait! Thank you Elisha! You'll love them! Fantastic cards Sandy. Love the SWEET images... and pretty colors. Yum, yum! Love the cards, Sandy! Thanks for the inspiration!! Love all your designs, very talented!